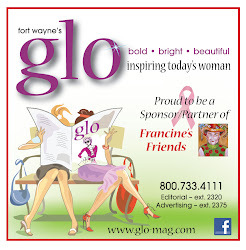 Francine's Friends: Vote Online and Help Francine’s Friends Win Up to $15,000! Vote Online and Help Francine’s Friends Win Up to $15,000! Click on the link below and VOTE today and EVERY DAY thru Sept. 23rd! Vote online for the "Byron Health Center & Breast Diagnostic Center” link at Pink Glove Dance, and Francine's Friends could win up to $15k! The Byron Health Center has been a company sight for the Francine’s Friends Mobile Mammography Coach for just 2 short years, but in that time one of their employees who had her mammogram on the coach, was found to have breast cancer. Because of the convenience of having the Francine’s Friends mammography coach there she was diagnosed early and on her way to a healthier life. Earlier this year Byron Health approached the Breast Diagnostic Center (BDC) about joining them in the Pink Glove Dance competition. (The video competition is sponsored by Medline.) Winners are selected by online votes. The first place winner of the contest receives $10,000 to donate to a charity of their choice and Byron Health and BDC have chosen Francine’s Friends! The overall winner receives $5,000 more, so there is a possibility of winning $15,000!!! Francine’s Friends has already received $2,000 as part of the competition — Thank you Byron Health Center and Breast Diagnostic Center! Voting has started, so vote every day and tell all your friends!!!! You need an email account to vote. Share the above link with all your contacts, on any social media (Facebook, Twitter, Instagram, etc.) asking all your friends to vote. You can vote one time each day, per e-mail address. The most votes win, so numbers count! Last year’s winner had less than 100,000 votes – we KNOW we can do better with your help! > Click here to go to the link to vote. > You'll be selecting Byron Health Center and Breast Diagnostic Center - which is the name the video was submitted under. Please note: it will NOT say Francine’s Friends. This is under the Standalone Healthcare category. > Vote once a day every day during the voting period — thru 11:59 p.m. CT 9/23/14. Winners will be announced on 10/2/14 at PinkGloveDance.com. Links directly to vote will be listed on the websites of Byron Health Center, Breast Diagnostic Center and Francine’s Friends: fw-breastdiagnosticcenter.com, byronhealth.org, Parkview.com and FrancinesFriends.org. Special thanks to everyone involved in this incredible day! Help us get out the vote and take home the Pink Glove prize!